Ultear Milkovich (sometimes translated as Urtear) is a character from Fairy Tail. 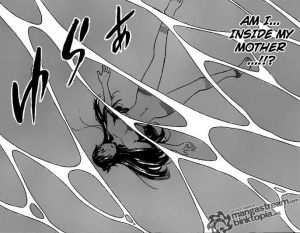 During the aftermath of the Tower or Heaven arc and Jellal Fernandes defeat, Ultear is seen taking a Bubble Bath and talking to her guilds master, Hades using a Communication Lacrima Crystal. During their conversation talking about Jellal being used and Zeref's whereabouts, Ultear is seen Crossing her legs. Afterwards, Ultear is seen out of the bathtub and getting ready to cover herself with a Towel as her back is exposed showing the marking of her guild, Grimoire Heart. This chapter is titled "Walk Strong" (強く歩け Walk Tall) and is in volume 13 and part of the Tower of Heaven arc. A Drink is seen next to the Communication Lacrima Crystal on the table next to the bathtub probably meaning Ultear had a drink at some Off Screen Momment during this bath. Ultear doesn't drain the bathtub as its still full when she is seen moving away from it. She has a Skinny Dipping scene in a vision she has during one panel after falling into the ocean during her fight with Gray Fullbuster. In the vision, she is naked in the ocean water where she realizes her mother Ur's soul is in the water and finds that she is joined together with it. This chapter is titled "The Power That Becomes Life" ("生"なる力) and is in volume 29. It was first released on July 6, 2011 in Weekly Shonen Magazine and in the series its part of the Tenrou Island arc. Both of Ultear's bath scenes were skipped in the anime adaption. If chapter 102's scene was in it would have been in episode 41. Ultear is the first character in the franchise to take a Bubble Bath. The second would be Erza Scarlet. Ultear is the only character in the franchise to use a Communication Device while bathing.